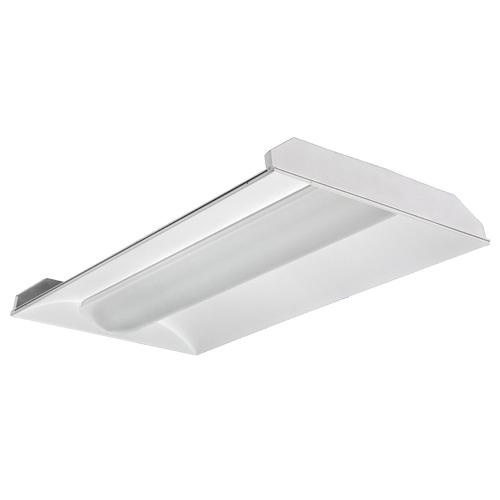 Lithonia Lighting VT Series Volumetric recessed LED troffer in polyester coated finish, features cold-rolled steel construction. Acrylic linear prismatic diffuser shade ensures excellent shielding and wide distribution. Troffer employs 69-Watt LED lamp with average life of 60000 hours to deliver light of brightness 7200 Lumens. LED Lamp has color rendering index of 80 and color temperature of 3500K. It withstands voltage rating of 120 - 277-Volts. Troffer measures 48-Inch x 24-Inch x 4-3/8-Inch. It uses 0 - 10-Volt dimmable eldoLED driver for reliable operation. It is ideal for use in offices, schools, retail locations and hospitals. LED Troffer is DLC listed and CSA certified.